One of my favourite family traditions at Christmas is to play board games and one of the games most synonymous with Christmas is Monopoly, so on day twenty three of advent we bring you the Monopoly set. 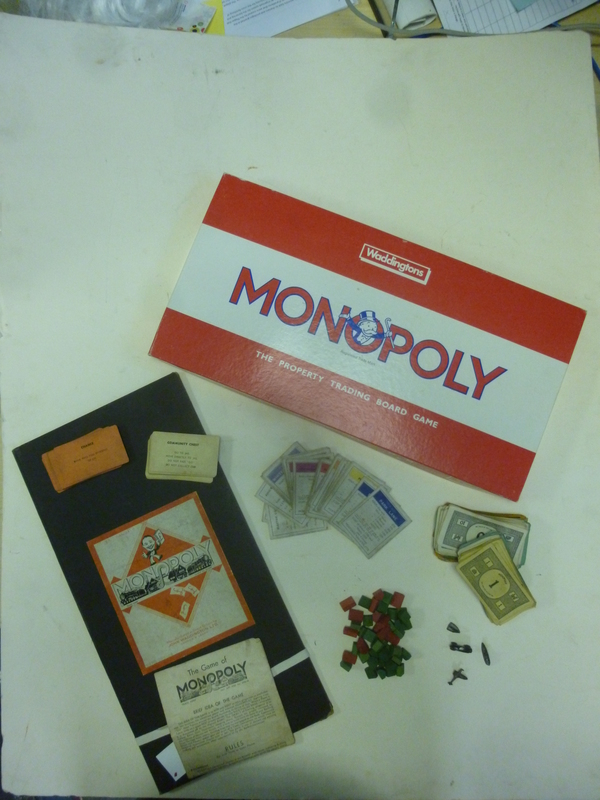 Monopoly was first produced in America in 1936 but it came to the UK in the same year when John Waddington secured a licences to publish it. 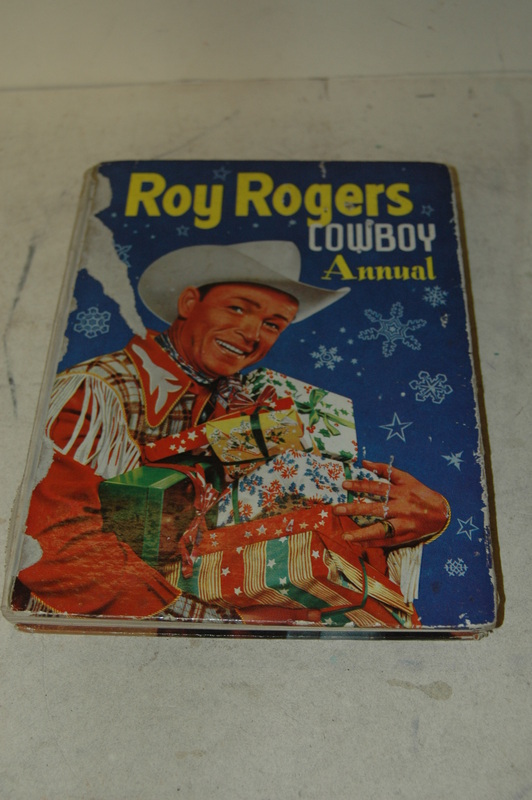 This edition probably dates to around the mid-20th Century as it has wooden houses rather than plastic. 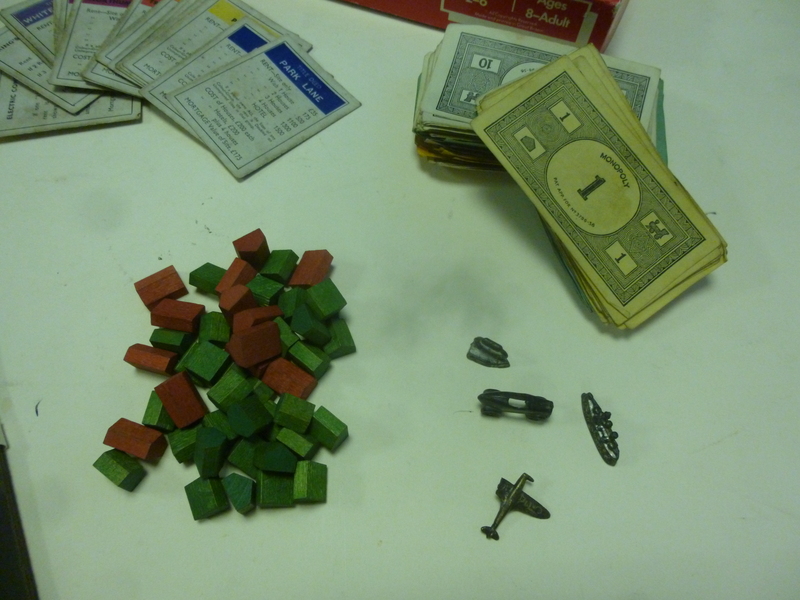 One of the best ways of dating Monopoly boards is to look at what the die is made from; earlier die were silver, then bone and later Bakelite or wood. Sadly however the die is missing from this particular set. This entry was posted in Adventures in Collecting and tagged board games, christmas, Collection, festive, Monopoly, Museum, museum collection, tradition on December 23, 2017 by Emma Sayer. 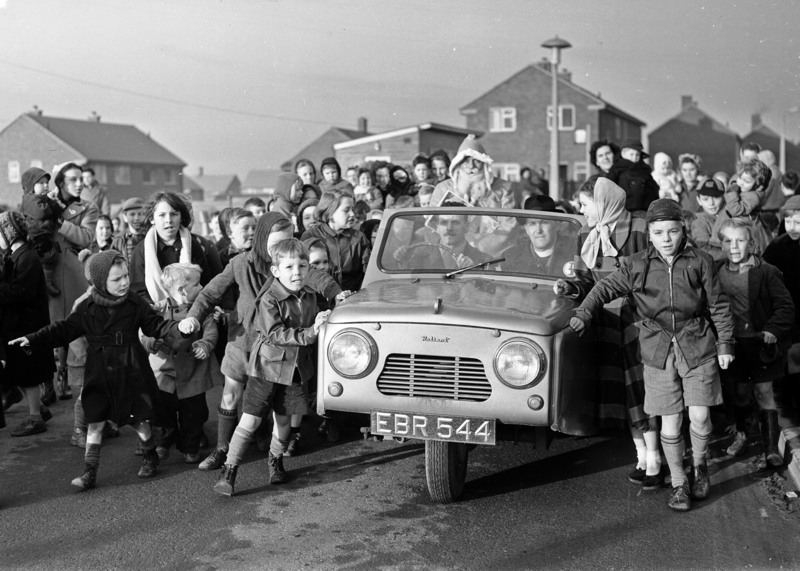 On day twenty two we’d like to share with you this fantastic image from our photographic archive of Father Christmas arriving at Peterlee in the back of a Robin Reliant Convertible. The image dates back to 1957 and we absolutely love how excited everyone is to see him! This entry was posted in Adventures in Collecting and tagged 1950s, arcive, black and white, christmas, father christmas, festive, image, Museum, museum collection, peterlee, photograph, photographic archive, robin reliant on December 22, 2017 by Emma Sayer. Christmas dinner wouldn’t be complete without a Christmas cracker; just imagine lunch without a silly paper hat, a daft joke and a small novelty compass that you’ll never use. But did you know that the first crackers were invented in the first half of the 1800’s by London sweet maker Tom Smith and they traditional contained sweets and small toys. 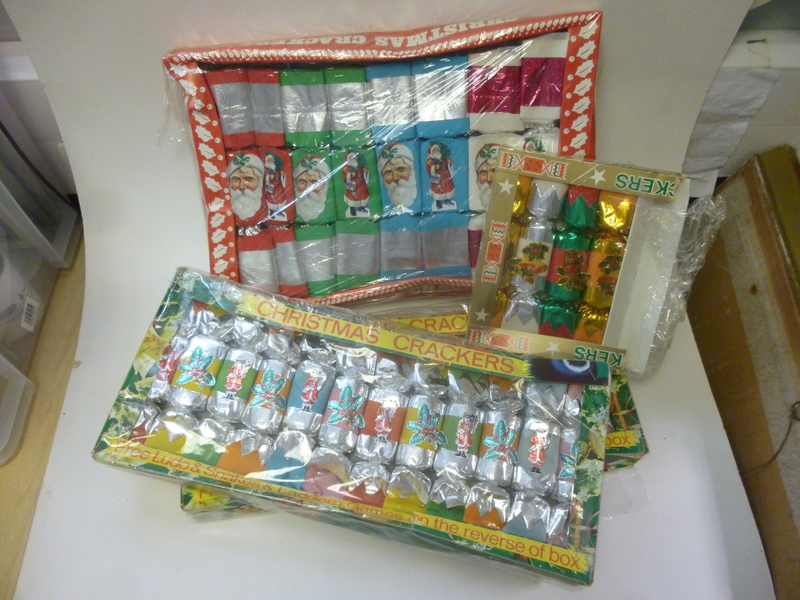 On day twenty one we bring you these crackers which date to around the mid to late-20th Century and have never been used! I wonder what we’d find if we pulled them….don’t worry, we’ll resist temptation! 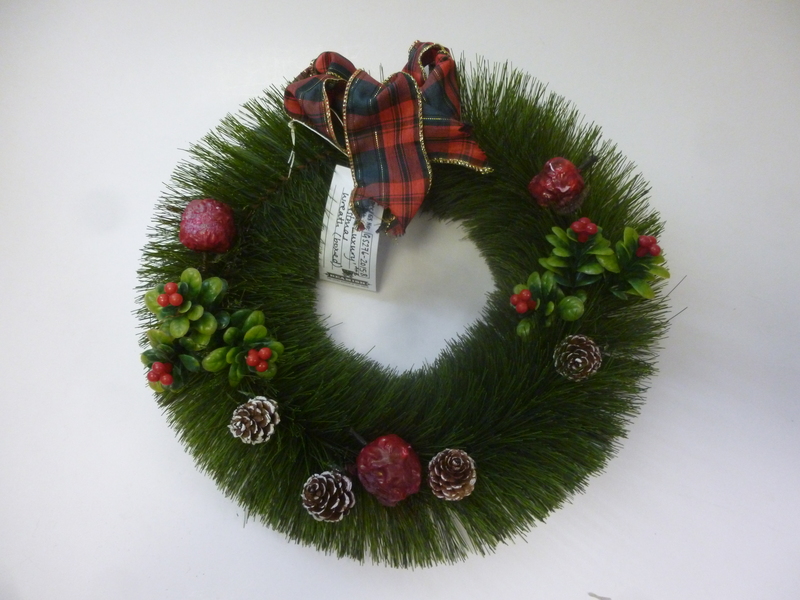 This entry was posted in Adventures in Collecting and tagged christmas, Collection, crackers, Museum, museum collection, tradition on December 21, 2017 by Emma Sayer. On day twenty of advent we bring you this fabulous set of bubble lights. Patented in 1935 by American Inventor Carl Otis, bubble lights had, by the 1940’s became the must have accessory for the Christmas tree. 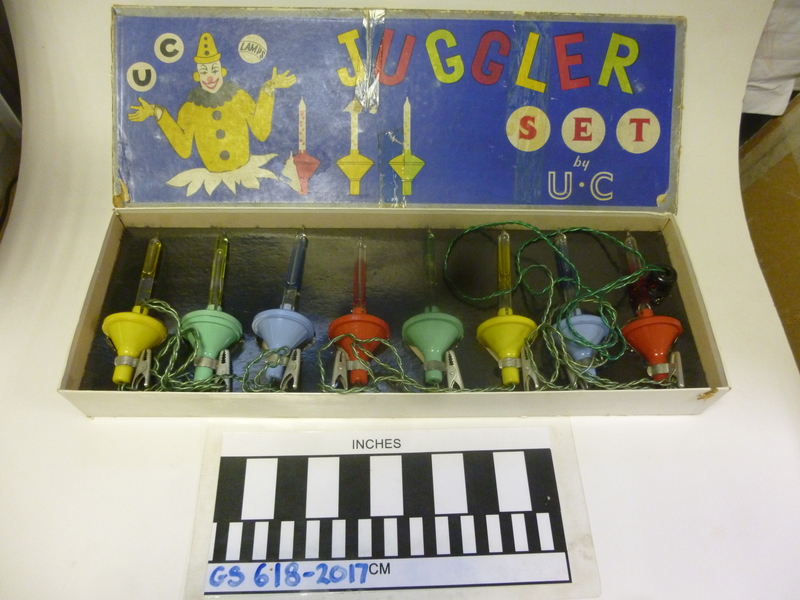 This Juggler set are by U.C. 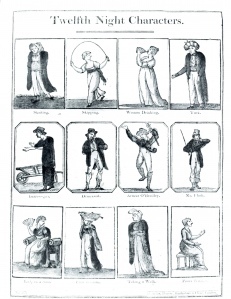 and date from around the mid-20th Century. The lights themselves are glass tubes filled with the chemical methylene chloride. At the base of each tube is a bulb which heats the methylene chloride up to make it bubble and In most the liquid is tinted a different colour. 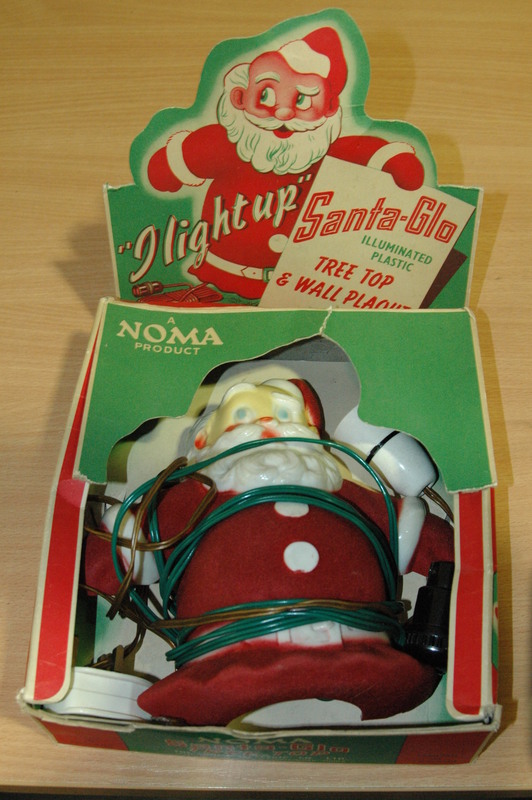 This entry was posted in Adventures in Collecting and tagged 1950s, bubble lights, christmas, christmas decorations, christmas tree, festive, lights, Museum, museum collection on December 20, 2017 by Emma Sayer. On day eighteen of advent we bring you another Christmas tradition – mistletoe! Hanging mistletoe in the home is a tradition that dates back to the ancient Druids, it was meant to bring good luck and ward off evil spirits, but later on it became tradition to kiss under the mistletoe as it represented love and friendship. 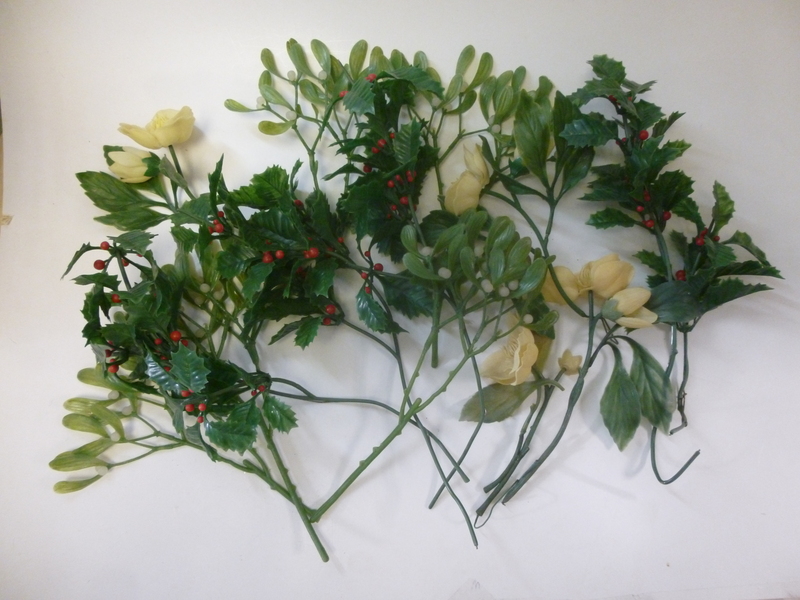 This mistletoe is plastic and dates from the mid-20th Century, there’s also some sprigs of plastic holly mixed in there too! 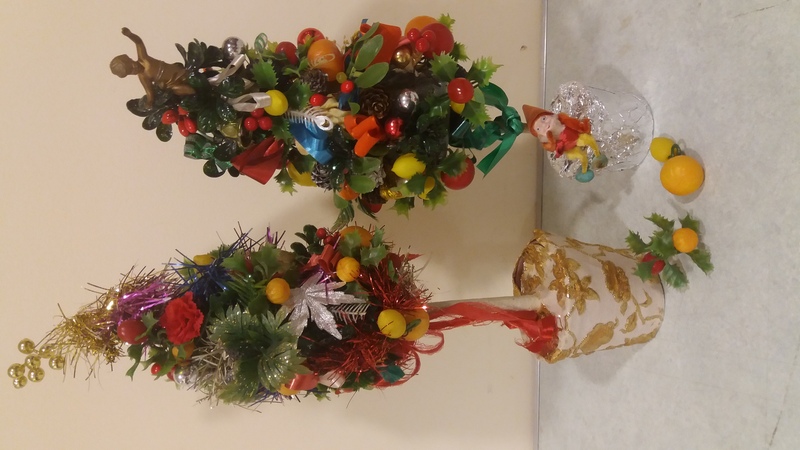 This entry was posted in Adventures in Collecting and tagged christmas, christmastradition, holly, misteltoe, Museum, museum collection, retro, tradition, vintage on December 18, 2017 by Emma Sayer. The aptly named bottle brush Christmas trees were highly popular in the 1950’s and were often used to decorate mantles or at the base of a larger Christmas tree, accompanied by a train set or tiny little winter wonderland. They were also sometimes used a centrepieces on tables and were decorated in all kinds of elaborate trinkets, ribbons and plastic jewels. 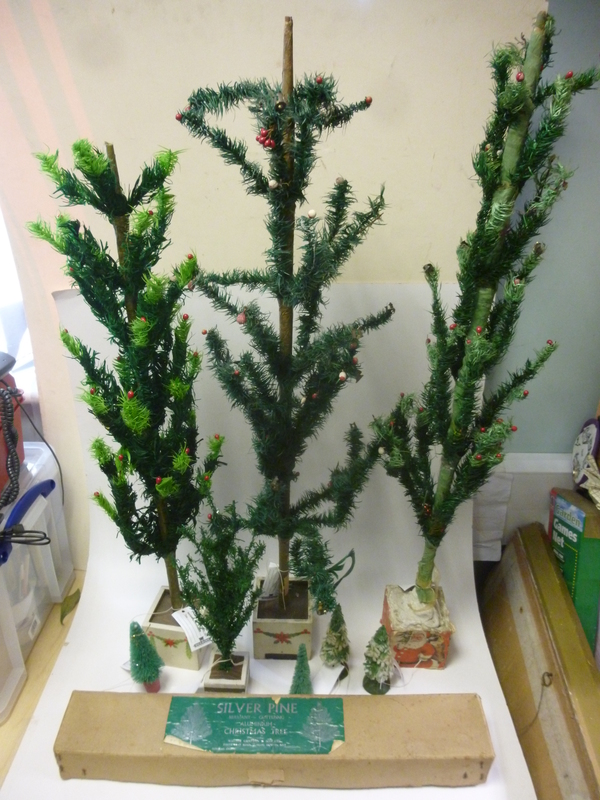 On day Fifteen of advent we bring you these beautiful examples of bottle brush Christmas trees! 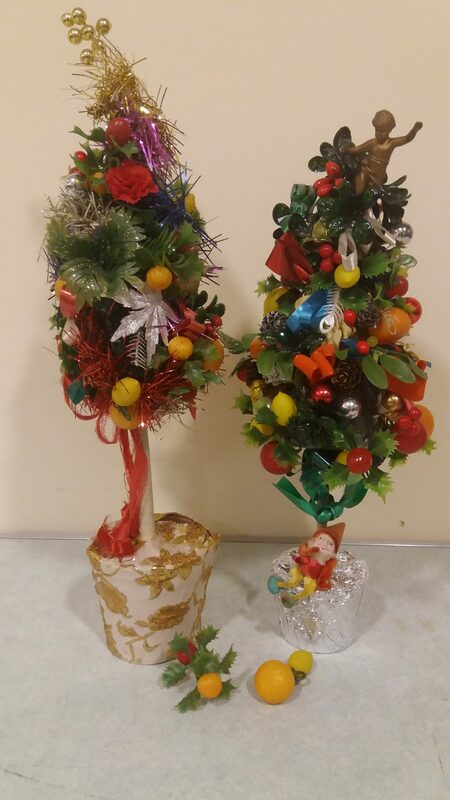 This entry was posted in Adventures in Collecting and tagged 1950s, christmas, christmastree, Decorations, festive, Museum, museumcollection, retro, vintage on December 15, 2017 by Emma Sayer. 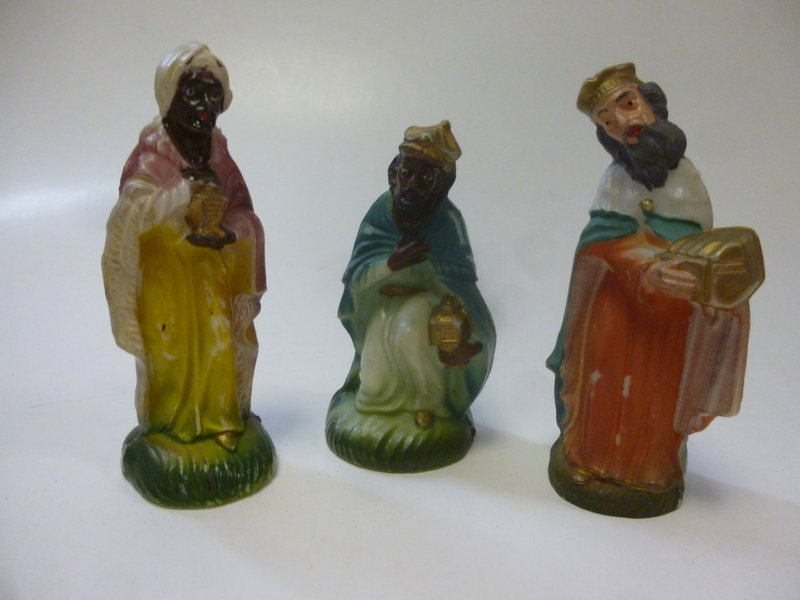 With both the snow and Santa’s arrival at the Museum The Collections Team are starting to get pretty excited about Christmas so we thought, as an advent treat, in the run up to the big day we’d share with you some festive offerings from the Beamish Collection. 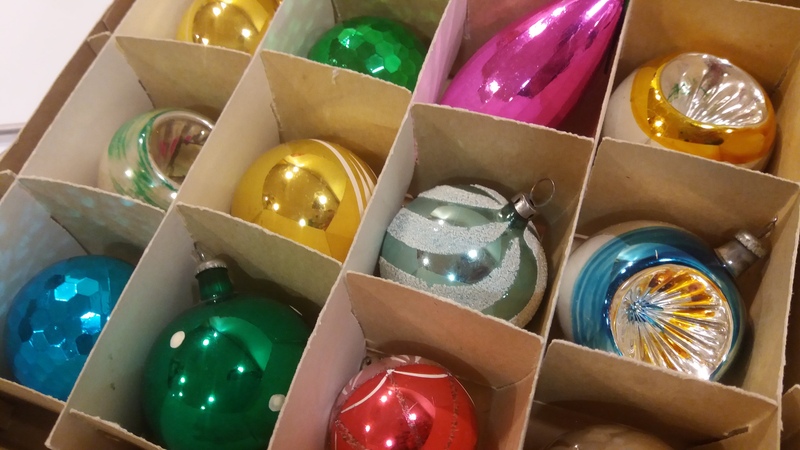 As many of us are starting to think about putting up our Christmas tree, these delightful mid-20th Century glass baubles seemed the perfect thing to bring you on day one of advent! We love the colours and classic vintage shapes. This entry was posted in Adventures in Collecting and tagged Advent, baubles, Beamish, christmas, Decorations, glass, Museum, vintage on December 1, 2017 by Emma Sayer.